the power truck get put back together ? Parts needed ? Thanks I advance. Art. Gilbert's F9s weren't the most realistic locomotives they ever made. They were a last gasp at saving the company from closing down. The whole line was cheapened to the point of no return. They're interesting from a nostalgic point of view, though. I recently brought a basket case to life, and even when they were new, they sounded like a coffee grinder. Anyway, the wire from the power truck goes to a lug on the top of the lead (non-power) truck. Make sure the insulated wheels on the lead truck are on the opposite side of the pick-up button. From your photos, it LOOKS like you have all the parts. 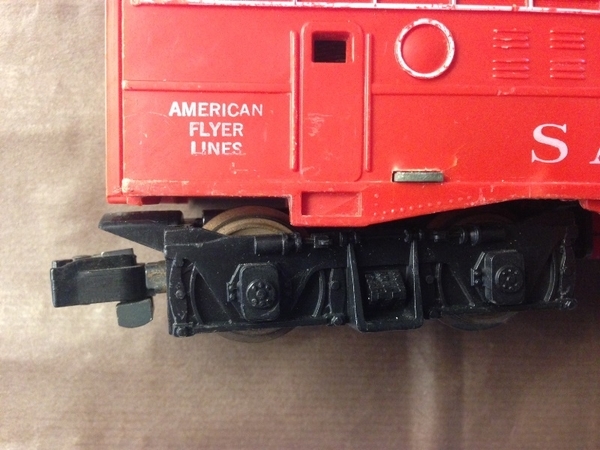 However, the UP's truck side frame isn't correct. It should have a protrusion towards the rear like the photo shows. It keeps the truck's torque from lifting the truck and coupler from the track. 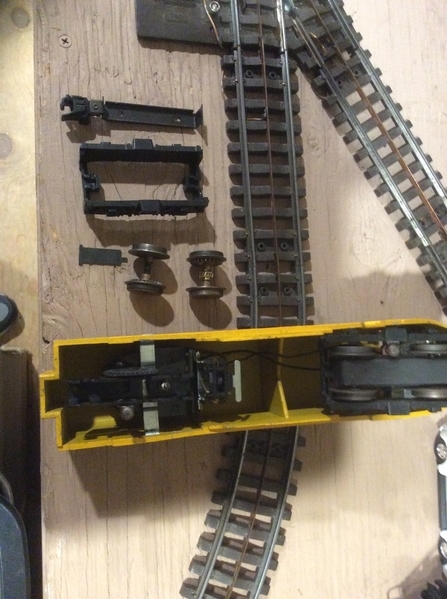 On mine, I was only missing the bottom plate with the coupler. I modified a non-coupler one to fit. There also seems to be two different wheel frames on these units too. The power frame is subtly different from the non-power one, so the metal base plates are slightly different. You seem to have the correct metal pieces, though. Finding the correct plastic side frame may be difficult. On mine, I was lucky in that this particular side frame was still on the locomotive. I was missing the side frame without the protrusion. It's the only one that is available as a reproduction. Assembly of the power truck is the reverse of disassembly. It LOOKS like the little tab in your photo takes the place of the protrusion on the power truck, but I'm not sure how it fits. I've not seem one like it before. Without seeing the actual parts, it's difficult to say. I'm not sure if its purpose or probably location. 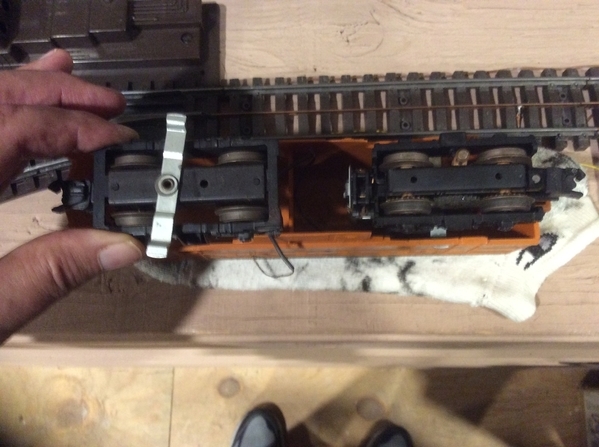 The plate with the coupler simply snaps onto the power truck after the geared axles are installed. Use your Great Northern unit as an assembly guide. Good luck on assembly. By the way, have you been able to get the motors running? They're not the most robust, but they DO run, assuming the armature or field coil aren't burned out. The reverse unit is also cheapened, and isn't the most reliable. I locked mine in the "forward" mode for running and reliability. As an interesting note, if you have one of the UP A units numbered 21216, it's quite rare. The non-powered unit us usually numbered 21215-1. The Union Pacific F9s are the only ones with an operating headlight. However, your track is quite weird! Just kidding. If I were in 3-rail, Super O would be my choice. Too bad it was at the end of Lionel's production. It could have evolved into something nice.